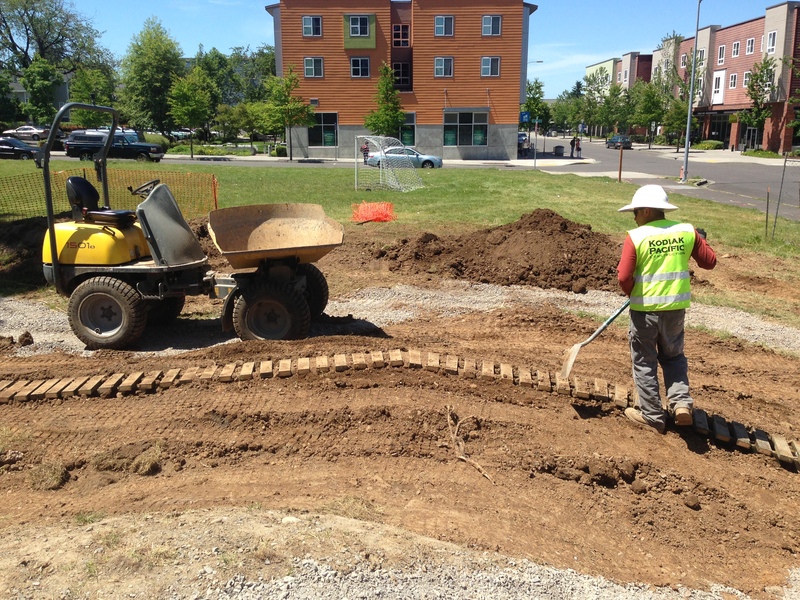 This week, we’re putting the finishing touches on New Columbia’s Bike Skills Park, located adjacent to the Bike Repair Hub on the corner of N. Trenton Street and N. Woolsey Avenue. 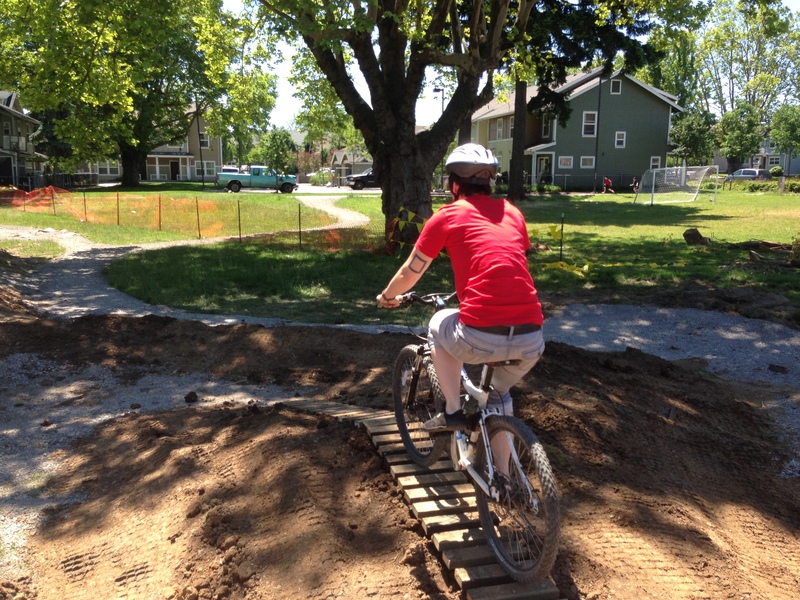 The park, opening in July, will offer a safe riding area for neighbors of all ages. Participants will learn about skill development through group instruction from We All Can Ride bike committee members and Community Cycling Center staff and volunteers. 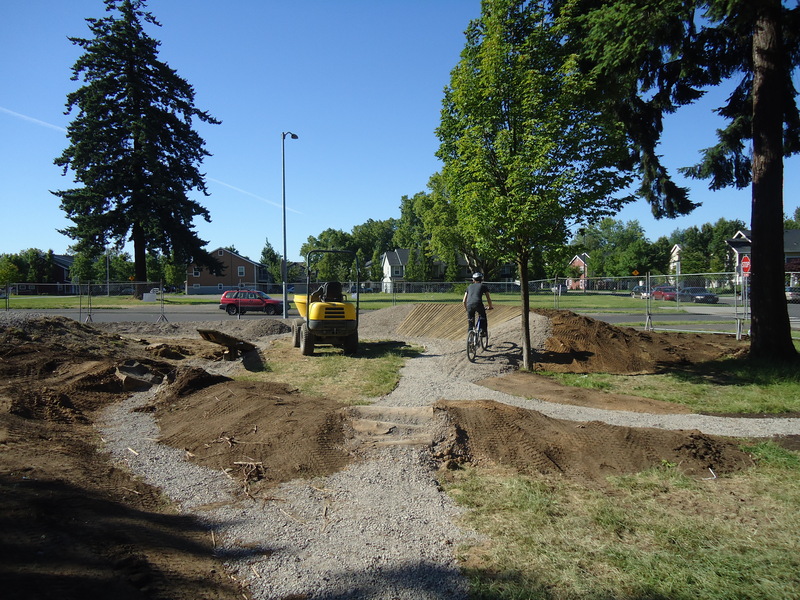 Additionally, We All Can Ride members furthered their ride leader training this year and will host summer bike rides so that residents can safely explore Portland together on two wheels. Safety – appropriate clothing and equipment to wear on the track; rules for the track. Basic bicycle balance – ability to ride without falling; cycling dexterity and agility. Proper pedaling and breaking techniques – building momentum and coming to a slow, controlled stop without skidding. Proper turning and steering techniques – ability to execute a tight radius turn in both directions. Advanced bicycle balance – standing high in the saddle and balancing while moving at slow speeds. Multiple task functions – ability to brake, signal, balance, and turn at the same time. Emergency maneuvers – safe breaking techniques and avoidance of natural obstacles and hazards. The Skills Park course includes beginning and advanced areas for people of all skill levels. The outside perimeter of the track contains looser turns and wider board rides for people at a beginning skill level. The interior of the track has tighter turns and board rides, pinch points (with boulders), and a teeter totter obstacle for those that want to work on more advanced skill sets. 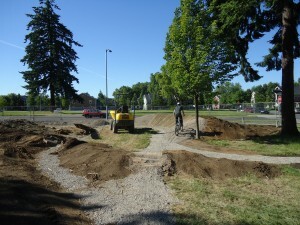 The Bike Skills Park project was made possible by a $15,500 grant from PDC. Home Forward, the property owner, will provide ongoing maintenance and security for the Skills Park, and we’ll provide the programming for the residents of New Columbia. 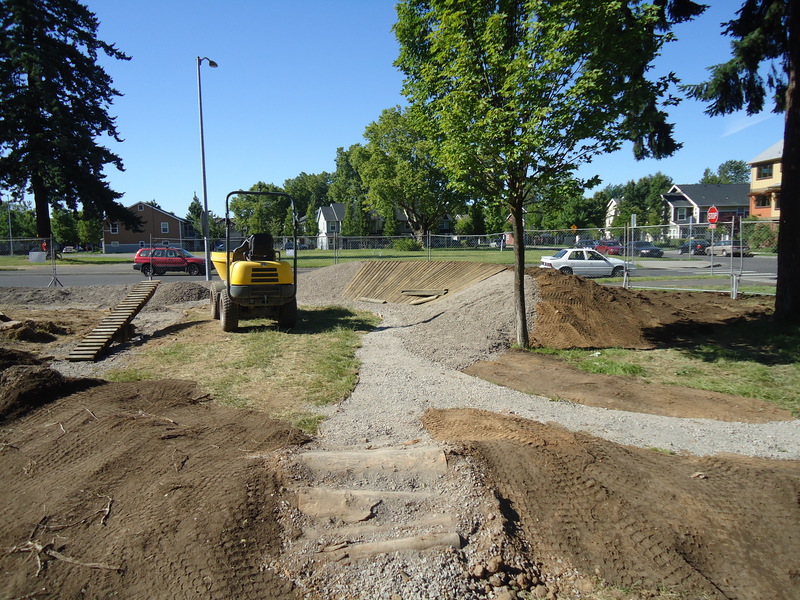 We’d like to thank the other fabulous partners involved in this project: MIG donated design time to the Bike Skills Park, members of Northwest Trail Alliance helped us refine the trails and ramps, M and M Construction is the general contractor on this project and generously donated a portion of their time and materials, and many other volunteers donated their time to building this park. It truly was a community effort. 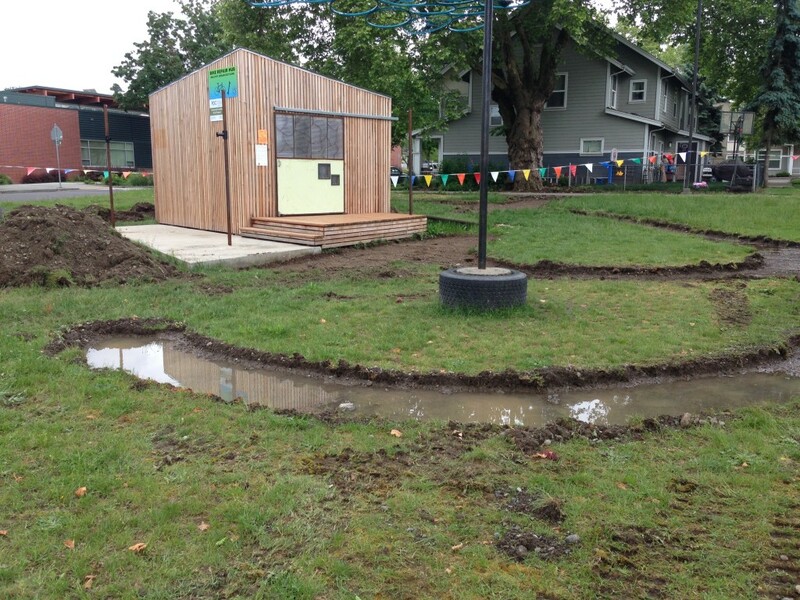 The Bike Skills Park is almost finished. If you haven’t had a chance to volunteer yet, now’s the time. 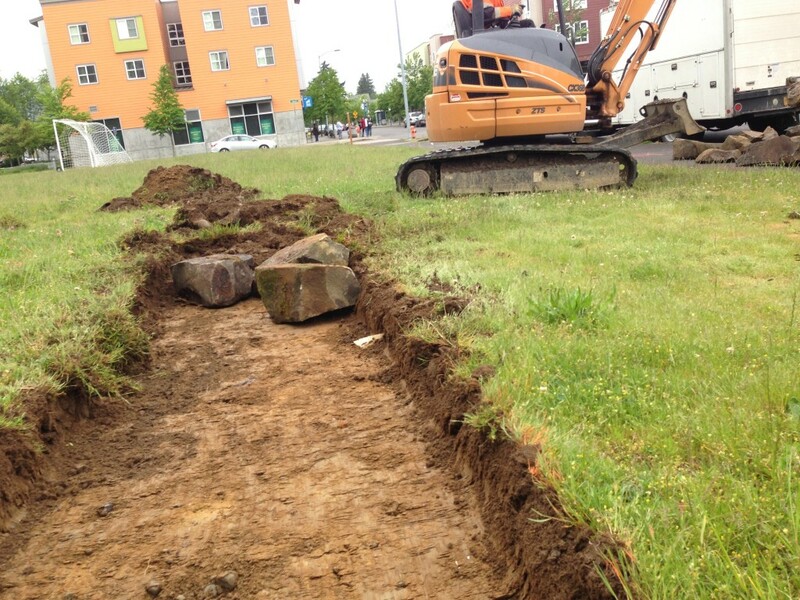 Join us on Wednesday, June 26th, from 9am to 4pm to put the final touches in place. We’ll be meeting at the corner lot on N. Trenton Street and N. Woolsey Avenue.